Note: these identification tips apply to both sexes. distribution Present throughout the mountains and Piedmont; very rare in the Sandhills (only two records), but seemingly absent from nearly all of the remainder of the Coastal Plain. abundance Generally uncommon, but may be fairly common, at least locally. flight In the Piedmont, late April to mid-July, and sparingly to late July; a later flight in the mountains by a month, from mid-May to mid-August. A recent report for 12 September in the Piedmont is extremely late and probably requires confirmation. 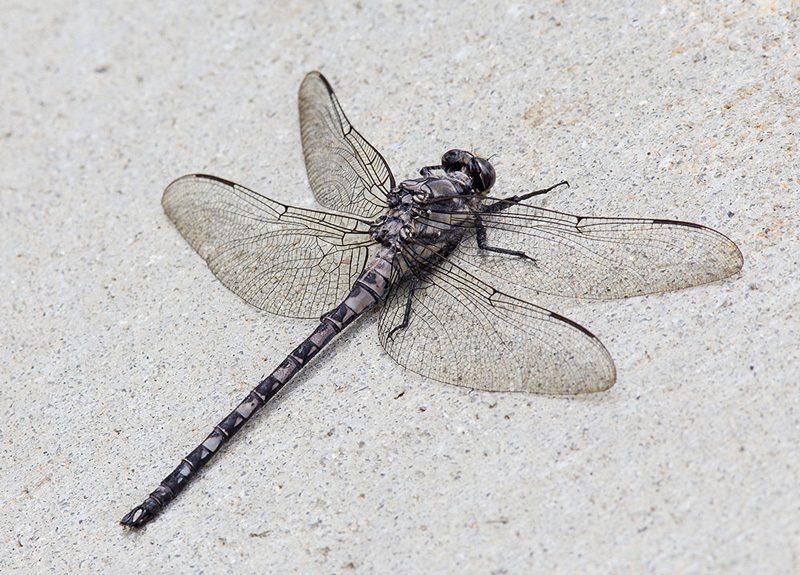 habitat Breeds in wooded seepages, one of the few dragonflies to breed in seeps. Adults seen in upland forests and edges. behavior Tame. Typically perches vertically on tree trunks, but also perches on humans! comments This is a "primitive" species. It is easily identified, as it is the only gray-colored species on the abdomen and as it often gives the observer an excellent view while it perches on tree trunks and other conspicuous places. It was formerly (20-30 years ago) thought be be rare (or very poorly known) in the state, but with many more observers afield, the species has been seen frequently, probably not representing a population increase. Though numbers are not overly great for a large dragonfly, its habit of flying to wooded openings in uplands, such as along jeep roads and sunny trails, and perching on tree trunks and humans, makes it readily conspicuous and an "odonate favorite". Comment: Orange, 2013-05-27, Emmitt Estate Perched on the new chicken coop eaves.